Rentokil Wasp Nest Destroyer Foam is a highly effective wasp nest killer suitable for treating visible wasps nests from a safe distance of 2m. Rentokil Wasp Nest Destroyer is an excellent wasp nest killer foam. It is perfect for the treatment of visible wasps nests in lofts, sheds, garages, trees or under eaves and, as it can be applied from 2m away, it allows you to tackle the wasps nest from a safe distance. Containing the wasp killing insecticides d-phenothrin and tetramethrin, the foam kills wasps as they return to the nest, killing the entire nest within 24 hours of treatment. 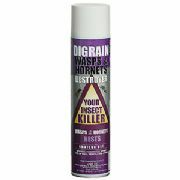 Each 300ml can contains sufficient product to treat 3 large wasps nests. NB This product is only intended to be used to treat visible wasps nests. If the nest is not visible, then please treat the entry point with Pest Expert Wasp Nest Killer Powder (see related products below).